June 2009's top seller was DC's Batman and Robin #1, with estimated first-month Diamond orders of 168,500 copies. It would ultimately be the fourth best-selling comic book of 2009, with reorders bringing it to 190,300 copies. June 2009 was notable for increasing prices, which set new records in the month with the average comic book offered in Diamond's top-sellers list selling for $3.50. Check out the detailed analysis of the month's sales here — and sales chart here. June 2005's top-seller was Marvel's House of M #1, with Diamond first-month orders of over 233,700 copies. Final orders including reorders brought the summer event issue to 248,200 copies, making it the 14th best-selling comic book of the 2000s. (See the whole list here.) Check out the sales chart for June 2005 here. Still, overall figures were up, a step in the right direction. Check out the sales chart here. 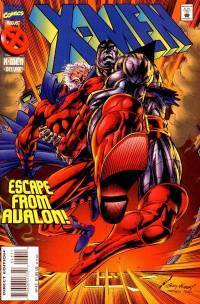 June 1995's top seller at Diamond was Spawn: Blood Feud #1; at Capital City Distribution, the top-seller was Marvel's X-Men #43. With newsstand and subscription sales, the X-Men issue almost certainly was the better seller overall; Capital's orders were 90,800 copies, with average annual sales for the title that year at nearly 333,000 copies. It was the last month in the year all distributors would have Marvel and DC comics: on March 3, 1995, the publisher announced it would shift all Marvel's products to its recently purchased Heroes World Distribution company as of July-shipping products. (A not-insignificant detail in all this: Heroes World stopped selling other publishers' products at the same time, cutting out sales from what was then the third-largest distributor.) On April 28, DC announced it was going with Diamond exclusively with its July-shipping products. Dark Horse did the same for November items, and Image for December items. Capital City did get two additional months of DC products by filing a lawsuit against DC and Diamond, but for practical purposes, June 1995 was the end of the multi-distributor direct market the industry had known for more than a decade. The average price of comics in Diamond's Top 300 was $2.48, and the average comic book ordered within Diamond's Top 300 cost $2.43. The most common cost of comics was $2.50. Reported same-day prices on the bagged silver editions ranged from $15 to $30 in many places, and hit $80 in at least one. It was a watershed moment in the commoditization of new comics, decried by many at the time; Moondog's owner Gary Colabuono, declaring that the bagged editions were "the dumbest thing to come along in some time," announced his stores would no longer carry them. "It serves no purpose but to stimulate greed and speculation." Indeed, even the former Marvel executive who came up with the idea of the limited-edition Platinum Spider-Man #1 reprint wrote of his second thoughts in Comics Retailer magazine, years later: "I was taking advantage of the desires of the market and fueling speculator greed." June 1985's top seller at Capital City was Marvel's Secret Wars II #4. Capital's orders were approximately 63,200 copies, suggesting overall sales in the 300,000-to-400,000-copy range. A Barry Windsor-Smith issue of Uncanny X-Men, #198, came in second. House of M was terrible in retrospect. Given the thing was a rip-off of Age of the Apocalypse, but other than Xavier being dead and Wolverine suddenly remembering he's this boring guy named James simply by waking up I can't remember much of anything happening in the 7 issue thing. I can't imagine this getting beyond the proposal stage. Plus, the ending was just a pointless magic thing that had only a few mutants left... for some reason. No explanation other than the Scarlet Witch said so. I have to be honest, that is really lazy writing. As for Spider-man #1. Yes, I was a big McFarlane freak and this was his big book. One page was drawn on a big huge page so it looked even bigger. The story... It looked great! But even though McFarlane wasn't the greatest writer in the world, he did alright and had a couple good ideas in there. Unlike today, it actually was written like Peter Parker actually was. It even teased the return of Kraven. Man, I hope they never bring that guy back. Bringing Kraven back to life would be the worst idea ever.